Extroverts have energy that flows outwards. Their excitement, enthusiasm, and focus is poured into their environment. This can mean that they enjoy socializing, but it can also mean that they are drawn to activity and action with the world around them. Their environment is naturally engaging to them and they want to stay involved with it more often than not. ESFJs want a lot of social engagement and time spent in friendly interaction with others. ENTPs want to discuss ideas and theories stimulated by the world around them. Introverts have energy that flows inwards. They prefer to stay in the world of concepts, ideas, and inner experience. They enjoy solitude and privacy and they can be alone with their thoughts for long periods of time without getting bored or drained. In fact, being alone with their thoughts is stimulating and energizing to them. ISTJs like gathering and analyzing information and reflecting on their experiences. INFPs like analyzing their values and imagining future possibilities. Is there any science behind the theory of introversion or extroversion? Studies have shown that introverts are more sensitive to dopamine activity in their brain. While extroverts and introverts both have the same amounts of dopamine, extroverts are more positively stimulated by it, and introverts are more negatively stimulated by it. Other studies have shown that extroverts demonstrate less cortical arousal than introverts do. This finding shows us why introverts seek less sensory stimulation in their environment, while extroverts need more stimulation. What an introvert considers noisy, busy, painful, or overwhelming might seem “normal” to an extrovert. Okay, that’s all great, but let’s get to the point! 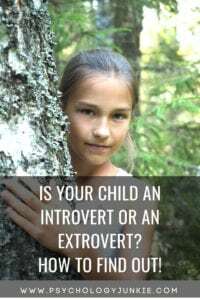 How can I find out if my child is an introvert or an extrovert? Observe your child in their natural surroundings. Do they seem to have energy that flows out of them? Are they always looking for another project, another activity, or another person to spend time with? Extroverted children jump right into life and like to stay active with a variety of activities. They tend to be doers first, and later reflect on what they experienced, said, and heard. Extroverts can have social anxiety. Extroverts need alone time when they’re exhausted. Extroverts can enjoy spending hours and hours alone on technology. Extroverts can be deep and creative. Does your child seem eager to stay engaged in activity? Does your child like variety and action? Does your child seem energized and excited by activity and interaction? Does your child get bored or depressed when they have to spend a lot of time alone? Does your child easily speak loudly and raise his or her voice? Does your child learn best by “doing”? Does your child struggle not to interrupt? Be aware that you may not answer “yes” to every single question here and your child still may be an extrovert. Some children are more extroverted than others, and some children may be shy and therefore less talkative in social settings. Now hang onto that information and let’s talk about the introverted child. What will they be like? Does your child seem to collect and preserve their energy as if they are holding it close within? Do they like to retreat to their room to imagine, daydream, think, or reflect for long periods of time? Introverted children are more easily over-stimulated, even as babies. Having a lot of people over, having a lot of noise and bright lights around them can feel overwhelming. They can get bored when they have to focus on activities and outer-world projects for long periods. They like to get into their heads and they prefer calm, peaceful environments where they can reflect deeply. Introverts can be shy or confident. Introverts can have good communication skills. Introverts enjoy occasional socializing, particularly in a one-on-one context. Introverts can be shallow, just as extroverts can be. Shallowness isn’t tied to the E or I preference. Does your child need time to process and think before speaking? Does your child like to watch and wait before getting involved in activity or socializing? Does your child like to focus on one thing at a time intensely rather than jumping from activity to activity? Is your child private and contained? Is your child regularly looking for “retreats” where he can go to be alone? Does your child seem energized and stimulated after periods of alone time? Does your child get irritated or overwhelmed by busy environments? Many children will have a combination of introverted and extroverted qualities. This is because none of us are one-dimensional. Each personality type has two introverted and two extroverted mental processes. An ISTJ, for example, uses introverted sensing and introverted feeling as well as extroverted thinking and extroverted intuition. Confused? That’s okay, you can find out more about all that here. But which list of characteristics describes your child more? The extroverted list or the introverted list? A lot of people mistype their children (and themselves) as introverts because they enjoy binging on Netflix or being alone to use technology. This has created an abundance of people who identify as introverts but are actually extroverted. (Almost) everyone likes Netflix. Almost everyone can get addicted to technology use. Especially children. Even the most extroverted kids can while away the hours playing video games or watching their favorite shows. But where is their energy flowing? Usually, it’s flowing outwards. To the storytelling in games or shows, activity, socializing online with friends, gaming with friends, etc,. The introverted child will usually find excessive activity with technology over-stimulating after a while. Because it’s not letting them retreat inside themselves to their own subjective thoughts and ideas. Let me know what you think in the comments! Want to figure out how to find your child’s complete personality type? Get access to my “Parenting by Personality” course here.